This week on Spellburn we’re jumping straight to the front of the marching order to spotlight warriors and dwarves. 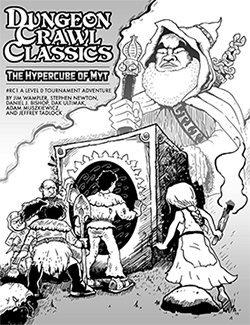 In the Dungeon Crawl Classics RPG, these two fighter classes aren’t your typical hack-and-slash, one-trick war-ponies. Between Mighty Deeds of Arms and improved critical hit ranges, there’s just the right amount of skull-crushing style to make these two character classes entertaining to play level after level. Whats the name of the band who sent an email i’d like to look them up? What movie/tv show was that little clip at the very beginning of the podcast from? The one with the conscientious objector a.k.a. coward voice that sounded like “Bender” from Futurama. That was Bender from a Futurama episode. Some of my players, when first attempting a Mighty Deed on a monster, would say, “I’ll just decapitate it”. I felt that this one-roll death stroke was bending the rules too far, and encouraged them more towards derring-do within the environment, going for crippling or blinding effects, etc. A big dropkick that knocks a monster into a fiery pit to its death works for me, but just a straight decapitation seems too overpowered. Perhaps if the monster was already knocked out or bound, the one-stroke kill Mighty Deed is OK? How would you judge this issue in your game? I rule that no mighty deed can auto-kill, although it can result in a deadly situation. Kick into the fire, where the fire kills? Sure. Decapitate? No. I also take the toughness of the foe into account when adjudicating deeds. Hack the sword hand off some schmoe? Sure. Hack Conan’s arm off with the same deed result? No, but you might force him to make a Fort save or drop his blade…..
And Daniel, that last Conan example could work even better, turned around: Go for a disarm, and if it’s Conan, he gets a Save to keep hold of his weapon. But if it’s just some schmoe, he is literally disarmed! How is that different from what I wrote? Your Deed looks like *going for* a severed arm (with no hope vs. Conan-level opposition), as opposed to going for a disarm (with the surprise severing vs. a mook). Thank you for the kind words, but the honour is mine! I’m not sure it got mentioned on the podcast, but warriors also add their class level to initiative rolls. When a mid- to high-level warrior faces a wizard, there is a good chance that he will have the chance to act first. I LOVE Mighty Deeds! In my group we have one dwarf and one warrior, both 2nd level. I am having trouble getting the players to remember to use their Deeds. I am busy running the show and I often forget to remind them. So this is a mechanic that hasn’t been fully explored at my table…yet. Oh…in case I didn’t say it, awesome podcast!